This blog will apply to all of you because either (1) you eat and want to know the best places around town; (2) you want to influence the Charlotte food community and/or (3) you want to reach a target audience. For #3, this blog is a tease for next month’s blog, which will be a deep dive on influencer relations. Stay tuned! Some of you are already familiar with the term, “influencer,” and are leveraging key influencers in your industry. If not, Dictionary.com defines an influencer as “a person who has the power to influence many people, as through social media or traditional media.” As PR practitioners in 2017, we work with influencers as much as we do with traditional journalists. They are an extremely valuable resource to our/your PR efforts! Within the food world, we call it “infoodence” – get it, get it? Given our work with Craft Tasting Room & Growler Shop, Wolfgang Puck Pizza Bar, Evoke, the Moo & Brew Festival and the N.C. Brewers Celebration, just to name a few, we’ve become friends with the foodies in town. 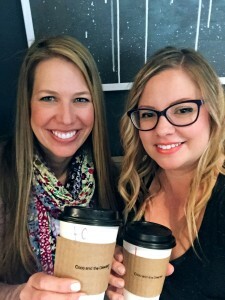 I had the pleasure of sitting down with one of our foodie influencer friends, Jessica Moore (@finickylady on IG), so you all could get to know her a bit better. If you want to know ALL the best bites, spots and dives in town, click follow on IG right now. I’m from North Carolina and was born in Hickory – the foothills. I was raised by my dad and he loved to cook; that’s where my love for food started and I became open to trying new things. I was his little taste-tester in the kitchen as a kid. We lived with my grandparents for a while because he was a single dad going to school, raising me and working all at the same time so I learned a lot of my values from him … by seeing how hard he worked. We moved to Charlotte when I was nine (so I’ve been here for 25 years; my whole life almost). I’ve always had a full-time job and actually worked two jobs for a while. I even had two jobs my senior year of high school; I guess I just like to work! I’ve always enjoyed having my own money and buying what I wanted to. My grandmother was a big influence in my life too – she told me to always be sure I could take care of myself and not depend on anyone else to get what I wanted. My motto is: have a high work ethic, be kind to people and do what you love! I’m very happy in my job now; it gives me the extra free time for opportunities like new menu tastings and fun food events. 2. What’s your full-time gig? I work for Maersk Inc in labor relations. My title is Assistant Manager of Operations. 3. Tell me about your path to being a foodie influencer. I always enjoyed being in the kitchen, chopping veggies and plating things. I was the sous chef (by the time I was able to handle knives of course) to my dad, a self-taught chef. Even to this day I serve as his assistant for Sunday dinners. I started taking pictures of food, probably back when technology advanced and the iPhone came out. I loved seeing how pretty food could look on the internet. When I started cooking, I was so proud of what I made that I wanted to show it off. It escalated to going out to dinner where the food was also well-plated and pretty. I wanted to share it and recommend it to friends and to strangers even. If I show you something beautiful, my hope is that you will want to try it too, and then tell me about it. I didn’t go to school for writing or anything. My writing is just a compilation of my thoughts put out there to the public eye. 4. Do you remember going to your first event? A friend tagged me in an Instagram post right when Eat Work Play (EWP) was brand new and they were looking for brand ambassadors. It was a flyer looking for writers. That was when I realized – I do this on my own time ANYWAYS, so I applied. It was a platform that could get me out there and invites that I would’ve never known about. I was chosen with about 10 other people from a pool of more than 50 back in October 2015. I honestly didn’t think I even had a chance. So, the EWP invitations were some of my first. I still talk to Davon and Jacob and go to some events but I’m trying to be more of a freelancer now. We are all still friends; I owe it to them. My goal in 2017 is to be more in the public eye and to step outside of my comfort zone, by not always doing food. I recently was involved in a nearby retail store’s marketing efforts so maybe I’ll add fashion to my list. My niche will always be food but doing something different is never a bad thing! 5. What are your thoughts on the food community? It’s not a competitive community here and I feel that might be a rare thing. When it comes to food, food always brings people together. I love being asked where I would go for dinner. My first question to you will always be, “What side of town?” because I need some kind of direction or I’ll end up giving you a list of 25 places. Even people at my office job ask me, “What’s new?” and “Where should I take my wife on date night?” I would really like to be the guru of Charlotte restaurants. I wish I could have a different iPhone and have people just text me all the time and ask, “Hey I have a friend coming in town, where should I go for dinner?” I really enjoy being a resource in the food community, at my full-time gig and even in my personal life. I like helping others; it makes me feel good. 6. Tell me about how you came up with Finickylady. I was invited to join Gmail (way back when, haha) and I was trying to come up with a good nickname. In short, it all started with conversations on where to go for lunch. For example, I knew I didn’t want salad or steak or a burger. Or, that I was in the mood for a wrap but I didn’t want it cold, it had to be a warm one. I always have particulars in my mind about things I want, whereas most people might not really care too much. I typically want to figure out exactly what I’m in the mood for. Since my colleagues didn’t mind, it ended up being me who decided. That’s how finickylady stuck; they knew they could count on me to narrow down the lunch choices. 7. What’s been your favorite event you’ve been invited to and why? I went to a spring menu luncheon recently and there were about 30 people there and they gave us six courses in 45 minutes — I was blown away. It was so fast! They even had the chefs come out and talk about each course while we were all taking photos. Packing all of that into a lunch-hour was impressive. Really, it just comes down to how the event is organized. I don’t ever have high expectations. I’m just thankful to be invited but when events aren’t done well, it makes it hard to have an enjoyable experience to then talk about it later in a positive way. 8. Do you need anything beyond the basics (e.g., décor, personalized items)? If you decide that what you have is worth presenting to people for free, I’m just happy to be there because you asked me. I don’t need a nameplate, decorations or anything fancy. I just need a drink to go along with whatever I’m eating. Seamless and smooth is all I need. I focus on the food and would rather not be distracted by things that don’t really matter. My friends can always tell from my IG posts when I wasn’t highly impressed by a particular restaurant or event because I won’t be as enthusiastic with my words. I will still make a “Thank You” post because that’s the right thing to do. I was treated to something and it’s important to show appreciation.